With spring upon us, thoughts turn to putting new plants in our flowerbeds, and what more perfect a choice for a garden than camomile. This attractive,delicate daisy-like flower has a sweet, almost appley scent and its aroma permeates any garden area. Camomile (also spelled chamomile) is used in many different ways, including cosmetics, herbal teas, bath preparations and in massage. 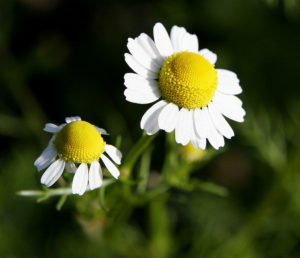 There are primarily two types of camomile essential oil – Roman (anthemis nobilis) and German (matricaria chamomilla). Of these two, Roman is used more for inhalations where as German is better for massage techniques. Roman only contains about 1.5% essential oil in its flowers and leaves and is steam distilled to extract the essential oil. German is extracted only from the flowers and contains more of the healing chemical azulene, which when isolated forms beautiful blue crystals. Azulene has been found to be very beneficial as an anti-inflammatory agent and only small quantities need to be used. This is why German (sometimes called blue camomile) is preferable for therapeutic purposes. Both camomiles have a wonderful calming effect on the central nervous system. When used in massaged, it is a great aid for ‘the blues’, grumpiness, fractiousness, over-stimulation and depression. Impatience, fearful nervousness and anxiety are also greatly reduced with soothing camomile, as is over-sensitivity and irrationality. Camomile works well to relieve headaches, especially from nervous tension and stress. It is one of the primary essential oils to burn in an aroma lamp for night fears, over-active minds, restlessness and insomnia. The root of this plant has been used in many preparations for teething problems in babies, and the essential oil is non-toxic enough to use in massage with children. Taken internally as an infusion or tea, this herb can calm colicky babies and sooth upset tummies. It also is wonderful for helping a child relax after nightmares or other night terrors by either being burned in an aroma lamp, given in syrup form or rubbed on in a massage oil. In pregnancy, camomile is equally beneficial for mother and child. It can soothe a fearful or anxious mood in the expectant mother so that the child won’t get restless and antsy. It can also relieve nausea and upset stomachs in the mother, allowing rest and relaxation for the fetus. Camomile is used in many skin preparations for its healing effect on wounds, acne, abscesses, eczema and open sores. Sunburns can be soothed with this oil. It is also used in many hair products especially those for blond hair as it brightens and lightens the hair, bringing out the natural highlights. Associated with the digestive tract for calming and relieving gastric disorders stemming from stress and tension, camomile can also be used to help soothe the liver from problems relating to anger and irritability. Colitis, intestinal ulcers, flatulence and gastritis are all beneficially affected by the use of camomile taken internally as a tea or in tincture form. As stated, its primary psychological benefit is in its ability to relax fractured nerves and calm irritability. It is wonderful burned in an aroma lamp during meditation as it allows the mind to norm out and deep relaxation to set in. It brings about a feeling of peace and well-being, as the stress and tensions float away. As a carpet of flowers in the garden, it is a welcome addition to any flowerbed bringing a sense of joy and cheeriness, plus a wonderful smell of freshness to the air. As a massage oil, it is a great addition to anyone’s collection for its physical as well as emotional benefits.